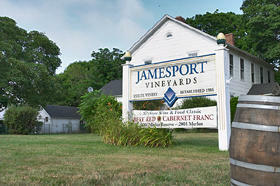 Jamesport Vineyards is one of the oldest vineyards in Long Island. It’s 60 acres of Early Rising Farm tended by a father-son team by name of Ron Goeler Sr & Jr. Goerler pere bought the 150-year-old barn that houses the winery and tasting room in 1986. Since then they have turned out a number of fabulous wines, one of which was reviewed here earlier. I was reluctant to review a second wine of theirs since I just recently gave them a write up not so long ago, but I could not resist. This nice sized winery, about 5,000 cases per year, makes some solid wines. When we were last at the winery, I went to pick up a couple of bottles of Late Harvest Riesling. While we were there, we tasted a couple of other wines. I bought some things, pleasantly surprised, and put them in the cellar. Yesterday, I pulled one of them out. My wife, Dominique, made a wonderful roast chicken (with lemon, rosemary, and butter, salt and pepper), with baked potatoes, fresh cut string beans, and a lovely salad for a very lovely Sunday dinner with the family. To accompany this warm meal, on the first cool day of the fall, I pulled out a bottle of Jamesport Pinot Noir, unfiltered 2002. I didn’t remember what it tasted like, I only remembered I liked it very much. But it was beautiful! The nose was pure bright cherries. As promised, dark cherry, plum, cola and smoky vanilla aromas also come through. The wine is a mixture of bright cherry and plum…very rich. Great mouthfeel. This is easily one of the best Pinot Noirs on the east coast, for folks who like a deeper pinot, and can stand up to any pinot made anywhere. Seek this out. Call Jamesport…or try my trusty default when trying to find NY State wines…Vintage New York. Seek this out…you don’t have to have a lot of money to feel rich…this is proof! Macari Vineyards has made some wonderful wines over the years, and I have long been a fan of Bergen Road, one of their signature wines. Bergen Road has long been one of the stars of east coasts reds. But they make more wines than just that one. I started a recent tasting with their 2004 Sauvignon Blanc. The nose was lemony and bright. Bright notes of green apple and citrus were high on the palate. It was fruity and crisp, with a nice dry, finish. A very nice sauvignon blanc. Next up for me was the 2003 Cabernet Franc. This is a 100% cabernet franc estate wine. There was a wonderful nose full of cherries. As I drank, both bright cherries and darker fruits came through. It was a wonderful mouthful of mixed dark berries, with nice acidity and a nice dry finish. This was a wonderful red, perfect with chicken, pork, or much darker meats. It was also a nice wine for sipping or with a plate of cheeses. A very nice experience. Lastly, I was curious to try the Block E, their late harvest desert wine. This edition was another wonderful surprise. The nose and mouth were filled with notes of honey, apricot, melon, and apple. It had wonderful acidity and excellent mouthfeel. Never too sweet, nor cloying, this was a well-balanced wine, that was a mouthful of desert in a glass. Wow! Hats off to the folks at Macari!! Mead Has Come to Long Island! As always, the wine industry, especially on the east coast in general, draws its heroes from all walks of life, and each story is something unique unto itself. This is the story of a long-time home winemaker who finally realized his dream, and became the hero of his own life, as well as a model for all of us who marvel at the brave ones who take a giant step forward, no matter the number of cases they produce. In a small town, in Holbrook, New York, located in central Long Island, is a new winery, nee’, a meadery, called The Long Island Meadery. Long the dream of 20-year Long Island Railroad veteran Paul Holm, the meadery offers a number of wines of varying types, from dry to semi-sweet. For those not in the know, beer and meade (and later wine from grapes) are some of the oldest beverages in the annals of human history, and came not long after milk and water. Mead, of course, is an alcoholic beverage made from honey, using wine yeasts. Meade (or meade as it is sometimes spelled) is sometimes also called honeywine. For some folks, mead is too over powering, and generally doesn’t have the roundness of most fruit wines. It is generally an acquired taste, but those who like mead, usually become fanatics. Holm has focused on dry and semi-sweet wines only. Nothing sick and syrupy sweet here. The wines are meant to go with salads, fish, and light meats, or just for sipping. He has also mixed his mead with some fruits, to add more complex flavors to his overall line. The results are something wonderful. The Peach-Apricot Mead is a white dry wine. The apricot comes through on the nose and slightly on the palate, but with nice acidity. The Strawberry Mead is a nose full of fresh cut strawberries, with a nice dry finish. Very nice. Both finish very dry. Strawberry-Raspberry is a slightly darker dry wine. The raspberry adds a much more robust flavor to the wine. It is rounder and deeper than the single strawberry mead. The Raspberry Mead is a big nose full of raspberries. It’s full flavored, and semi-sweet, and very nice. However, my absolute favorite was the Apple Cyser Mead. When you stick your nose in the glass, it smells like a wonderful baked apple. It’s semi-sweet, with wonderful acidity, and great full flavor. It’s nicely balanced, and not too sweet. 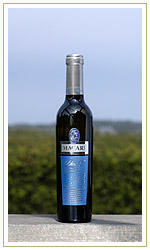 It is an excellent sipping wine, or great for cheese or with a slice of fresh apple pie with a slice of melted cheese. The other thing is that you could easily warm a bottle of this wine up on the stove with some mulling spices, and sip away a wonderful fall afternoon. What a great surprise. One of my favorite mead’s on the east coast! This is almost a one-man band, and one of the smaller wineries on the east coast, but as Shakespeare says, “though he be but small, he is fierce.” This is one of the better meads I have had the pleasure to taste. I recommend that on your next trip out to the North Fork, you should stop in and do a tasting. They are located at 1347 Lincoln Avenue, Suite 11, in Holbrook, New York. Their phone number is (631) 285-7469. You can find out more about them at www.LIMeadery.com. Enjoy!